Monday, May 8th: - It was a relief to pass from the sombre theme of judgment passed on Irish rebels to the quiet humours of Daylight-Saving. Sir HENRY NORMAN was perhaps a little over-anxious to be playful; and some of his rather ancient jokes gave obvious pain to Mr. PEARCE, who once carried a Daylight-Saving Bill through its second reading without any such frivolous words. The INFANT SAMUEL, as my esteemed predecessor used to call him, disclaimed the idea that he had become “a presumptuous JOSHUA.” The Government only supported the proposal because it would help us during the War by saving coal. Sir HENRY DALZIEL is the proprietor of a newspaper, one of whose most piquant features is a column entitled “Secret History of To-day,” in which one may read dark hints of Society scandals and political intrigues. Naturally enough he objects to the new regulation forbidding reference to the proceedings of the Cabinet. He had effective backing on this occasion from Mr. WALTER ROCH, who in a speech admirable alike in tone and substance appealed to the Government in their own interests to withdraw a ukase, under which, if strictly applied, Ministers themselves would be the first to suffer. 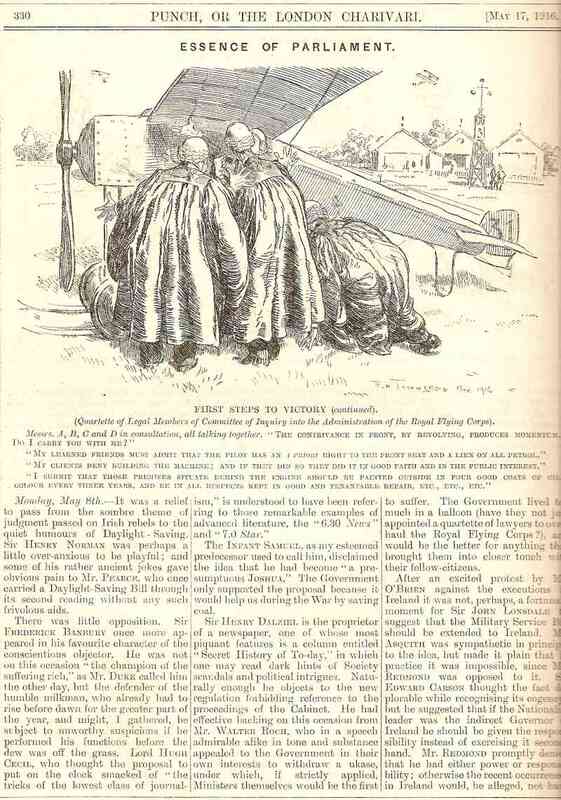 The Government lived too much in a balloon (have they not just appointed a quartette of lawyers to overhaul the Royal Flying Corps? ), and would be the better for anything that brought them into closer touch with their fellow citizens. After an excited protest by Mr. O’BRIEN against the executions in Ireland it was not, perhaps, a fortunate moment for Sir JOHN LONSDALE to suggest that Military Service Bill should be extended to Ireland. Mr. ASQUITH was sympathetic in principle to the idea, but made it plain that in practice it was impossible, since Mr. REDMOND was opposed to it. 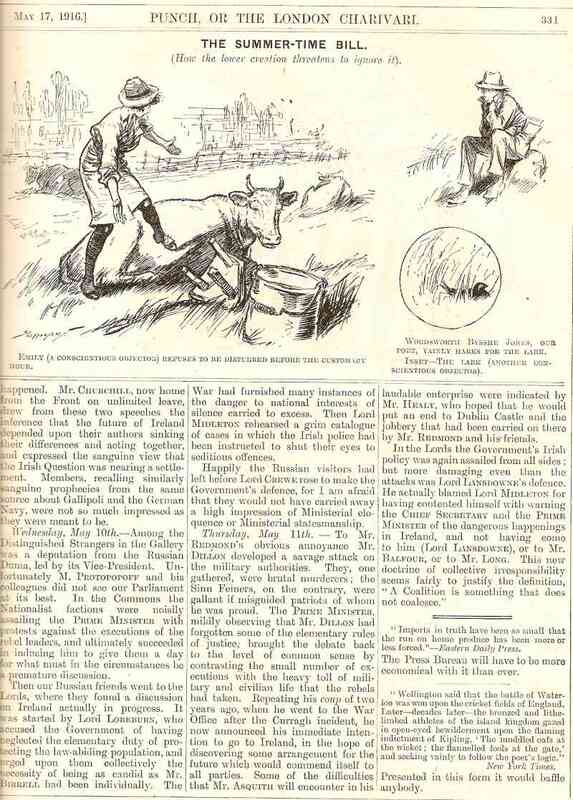 Sir EDWARD CARSON thought the fact deplorable while recognising its cogency: but he suggested that if the Nationalist leader was the indirect Governor of Ireland he should be given the responsibility instead of exercising it second-hand. Mr. REDMOND promptly denied that he had either power or responsibility; otherwise the recent occurrences in Ireland would, he alleged, not have happened. Mr. CHURCHILL, now home from the Front on unlimited leave, drew from these two speeches the inference that the future of Ireland depended upon their authors sinking their differences and acting together, and expressed the sanguine view that the Irish Question was nearing a settlement. Members, recalling similarly sanguine prophecies from the same source about Gallipoli and the German Navy, were not so much impressed as they were meant to be. Wednesday, May 10th: - Among the Distinguished Strangers in the Gallery was a deputation from the Russian Duma, led by its Vice-President. Unfortunately M. PROTOPOPOFF and his colleagues did not see our Parliament at its best. In the Commons the Nationalist factions were noisily assailing the PRIME MINISTER with protests against the executions of the rebel leaders, and ultimately succeeded in inducing him to give them a day for what must in the circumstances be a premature discussion. Then our Russian friends went to the Lords, where they found a discussion on Ireland actually in progress. It was started by Lord LOREBURN, who accused the Government of having neglected the elementary duty of protecting the law-abiding population, and urged upon them collectively the necessity of being as candid as Mr. BIRRELL had been individually. The War had furnished many instances of the danger to national interests of silence carried to excess. Then Lord MIDLETON rehearsed a grim catalogue of cases in which the Irish police had been instructed to shut their eyes to seditious offences. Happily the Russian visitors had left before Lord CREWE rose to make the Government’s defence, for I am afraid that they would not have carried away a high impression of Ministerial eloquence or Ministerial Statesmanship. Thursday, May 11th:- To Mr REDMOND’S obvious annoyance Mr. DILLON developed a savage attack on the military authorities. They, one gathered, were brutal murderers; the Sinn Feiners, on the contrary, were gallant if misguided patriots of whom he was proud. The PRIME MINISTER, mildly observing that Mr. DILLON had forgotten some of the elementary rules of justice, brought the debate back to the level of common sense by contrasting the small number of executions with the heavy toll of military and civilian life that the rebels had taken. Repeating his coup of two years ago, when he went to the War Office after the Curragh incident, he now announced his immediate intention to go to Ireland, in the hope of discovering some arrangement for the future which would commend itself to all parties. Some of the difficulties that Mr. ASQUITH will encounter in his laudable enterprise were indicated by Mr. HEALY, who hoped that he would put an end to Dublin Castle and the jobbery that had been carried on there by Mr. REDMOND and his friends.